Sampurna Chattarji was born in November 1970 in Dessie, Ethiopia, grew up in Darjeeling, graduated from New Delhi and is currently based in Mumbai. Her poetry collection, Sight May Strike You Blind, published in 2007 by the Sahitya Akademi (India’s National Academy of Letters) was reprinted in 2008. 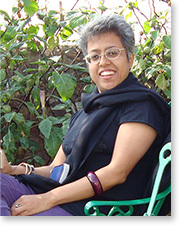 Sampurna’s work has appeared in Indian and international journals such as The Little Magazine, New Quest, Indian Literature, Stand Magazine, Wasafiri, Drunken Boat, The Literary Review, Wespennest and anthologized in 60 Indian Poets (Penguin); We Speak in Changing Languages (Sahitya Akademi); Imagining Ourselves (IMOW, San Francisco); Fulcrum (Fulcrum Poetry Press); The Bloodaxe Book of Contemporary Indian Poets (Bloodaxe). Her 2004 translation, from the original Bengali, of Sukumar Ray’s poetry and prose Abol Tabol: The Nonsense World of Sukumar Ray was reissued in 2008 as a Puffin Classic titled Wordygurdyboom! Sampurna has authored several books for young people, including The Fried Frog and Other Funny Freaky Foodie Feisty Poems (Scholastic). Her first novel Rupture was published in 2009 by HarperCollins. Her second poetry book, Absent Muses, is forthcoming.